My take is that basically the Knights are the new “Elite” for the Halo franchise but have magical transportation powers and dude that hovers over their shoulder with a light shield when things get a bit too heavy. Did I mention they also an auto sentry just to add into the mix? 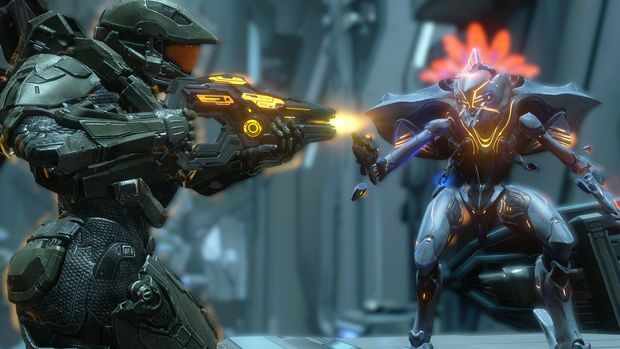 Playing Halo 4 and 5 can be quite daunting on Heroic and Legendary modes, particularly near the end of the campaign where Knight numbers seem to crank up. If you’re the kind of player that likes to stand their ground and kill everything in sight, here’s some tips on taking out the Knights. There are plenty of other ways to take kill Promethean knights, the above tips and tricks are just a few of the ways you can take them down efficiently. Using grenades and some of the other weapons in the sand box are options. I find a well-placed rail gun blast to the body of a Knight very satisfying.